The throttle body controls how much are is entering the engine, making sure it’s just right. If your car is showing symptoms of a faulty throttle body, such as reduced power or rough idle, you'll want to get it checked out. 1. Your check engine light is on: In an ETC system, the control module constantly monitors throttle body performance. If it detects a problem with the throttle body, it will turn on the check engine light. 2. You notice a lack of power or poor engine performance: An engine needs air and fuel to make power. If the throttle body isn’t supplying enough air to the engine, you may see a lack of acceleration power and poor engine performance. 3. Your car idles poorly: The amount of air entering the engine affects idle speed and quality. A faulty one can cause rough idle, or it can cause the engine to race at idle. It could also cause the car to stall. 4. Your car is stuck in “limp-home mode”: A problem with the throttle body can result in the car’s computer putting the car into “limp-home mode.” Throttle operation will be limited and the car’s power will be reduced. A “Reduced Power” warning may also appear on the dash. Your engine burns a mixture of air and fuel when it is running. 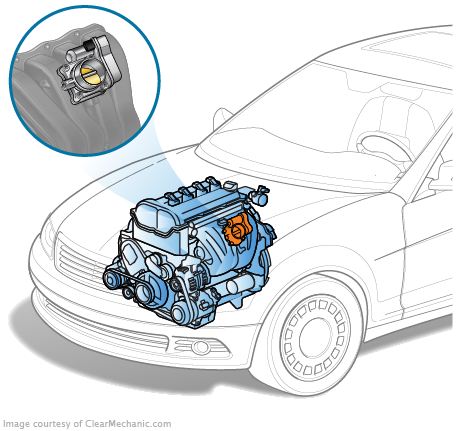 The throttle body controls the amount of air entering the engine; more air means more power, less air means less power. Incorrect air flow can result in poor engine performance, reduced power, poor idling and other problems. Within the throttle body is a throttle plate, which opens as you press down the gas pedal. The throttle body is located between the air intake assembly and intake manifold. Until the mid-2000s, the majority of throttle bodies were mechanically controlled. The throttle body was connected directly to the gas pedal by a cable or linkage. When the driver pushed down on the pedal, the cable would pull the throttle plate open, allowing air into the engine. Throttle bodies on cars made since that time are usually electronically controlled. In an electronic throttle control (ETC) system, an electric motor is used to open and close the throttle plate. The motor is controlled by a computer, called a control module. This may be either a dedicated throttle body module or the powertrain control module. This computer controls the throttle motor based on input from the throttle position sensor and accelerator pedal position sensor. ETC systems reduce emissions and improve fuel mileage. They also help make other advanced vehicle systems possible, such as adaptive cruise control. If you’re experiencing some or all of these symptoms, you’ll want to take your car to a certified mechanic for diagnosis. There could be a few different problems with your throttle body. The part could just be dirty — grime can build up inside its housing, pinching off air flow. In this case, it may just need a cleaning. If the problem is more severe, further diagnosis will be required. Any stored trouble codes will need to be properly diagnosed and the appropriate action taken. This could include the replacement of the throttle body or a related component. On some vehicles, the control module will have to be reprogrammed after throttle body replacement. We recommend a complete throttle body service every 30,000 miles. Having it serviced at these intervals will help reduce the chance of any related drivability concerns. Where can i find the throttle position sensor on this car and could this be a reason why my car is stalling? How do you clean a dirty throttle body without spraying on it or in it directly ? ?